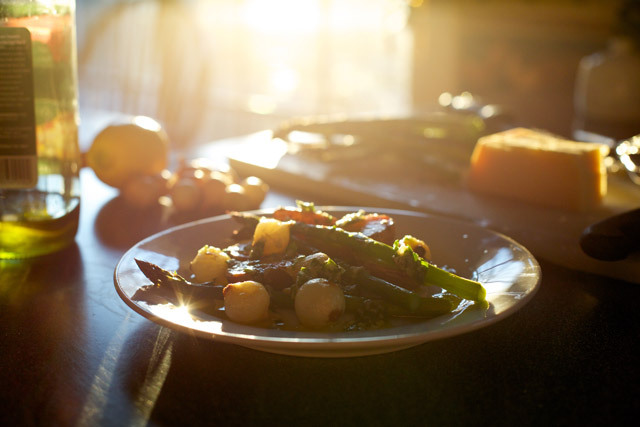 In my opinion, the simplest and most rewarding vegetable-cooking technique is roasting. It requires time, yes, but 80% of the required time is inactive, which means you can use it to katch up with your Kardashian episodes. I like my roasted vegetables to be very crispy and caramelized, so I tend to roast them at a fairly high temperature, like 400 F or above. If you are roasting something with a high water content like tomatoes, you could go lower to let the flavors concentrate without too much browning, but I’d stay above 350. Roasting is one of those things you have to practice to figure out what you like and what your oven will do, but it’s forgiving enough that your experiments will always turn out edible, if not quite delicious. 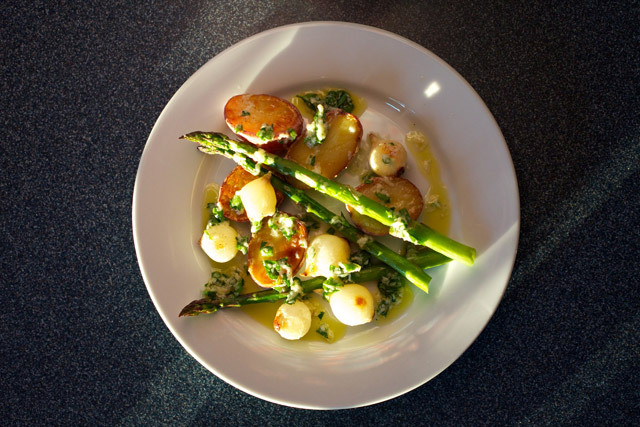 For this demonstration I decided to make some roasted spring vegetables: baby red potatoes, pearl onions, and asparagus. The whole thing took about an hour, but the veggies all have different cook times, so I added them to the pan in order of how much time they needed. Start by cutting your potatoes in half or quarters depending on how large they are. Then pile them on a baking dish, (I like mine lined with non-stick foil) toss them with olive oil, and season them with salt and pepper. Spread them out, throw them in your pre-heated oven, and let them roast for 15-20 minutes. While the potatoes roasted, I peeled my pearl onions. Peeling pearl onions without blanching them is stupid, but I was hell-bent on not adding another step to this process, so I stood over the sink for what felt like my whole life peeling these suckers by hand. And, obviously, it turned out to be a beast of a step anyway. If you MUST have pearl onions like me, just blanch them – the skins will come off easily and you will save yourself some grief. If you are smarter than me, get a regular onion, cut it in wedges like a normal person, and roast that instead. Put the onions and potatoes in the oven for another 25-30 minutes while you snap your asparagus. Roasted vegetables usually taste amazing without any fancy seasoning, but if you want to gild the lily you can make dressing. I made one with lemon, garlic, parsley, olive oil and grated Grana Padano cheese. PS grating garlic on a microplane is a lot faster than mincing it with a knife (for me anyway). After your potatoes and onions have roasted, add the asparagus to the pan (with more olive oil and salt) and throw everything back in the oven for 10-15 more minutes. 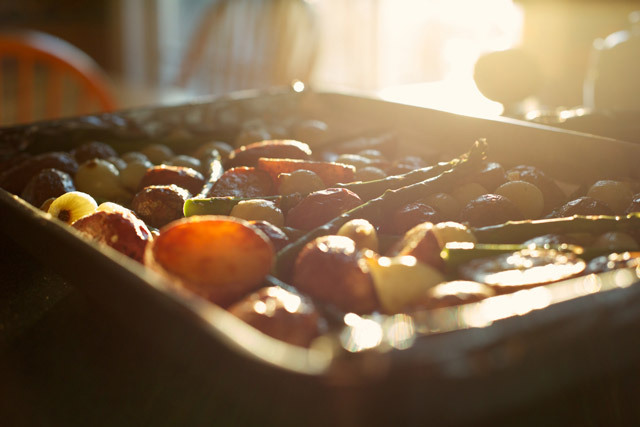 The main things to remember when roasting any vegetable are: cook time, seasoning, and not crowding the pan. Any hard root-vegetable is going to require at least an hour of cooking, so plan accordingly. 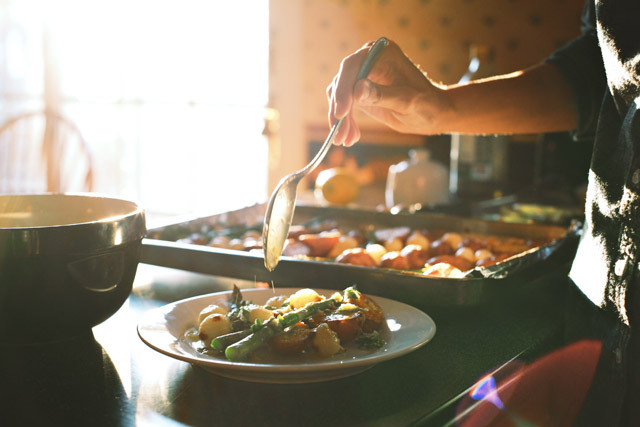 Onions and brussels sprouts can be done in 30-45 minutes, and smaller vegetables with higher water content like asparagus and green beans can be done in 10-20 minutes, depending on whether you want them crisp-tender or just done. Always toss the vegetables with some kind of cooking fat like olive oil or peanut oil or butter, and always season with salt. From there you can add any spices you want. Even woody herbs like thyme and rosemary can go in and roast with the veggies. Fresh herbs like parsley and dill should be added at the end so they don’t burn up and lose their taste in cooking. When it comes to crowding the pan, keep in mind that all vegetables contain water, and that the real beauty of roasting is that dry heat causes caramelization. When your pan is over crowded, your vegetables steam instead of roast and it makes it difficult for them to form any lovely brown and crispy edges. Aim for at least a half inch of space between all your veggies, but a little less than that won’t be the end of the world. If the pan is really tightly packed though, bust out another baking sheet and let everything breathe. If you line your pans with foil they might not even get dirty anyway. Roasted vegetables are so simple and so much more delicious than steamed vegetables. If there’s any vegetable in the world that you think you don’t like, try roasting it and try not to change your mind. This makes my mouth water. Thanks for the tips. I'll be giving this a try.